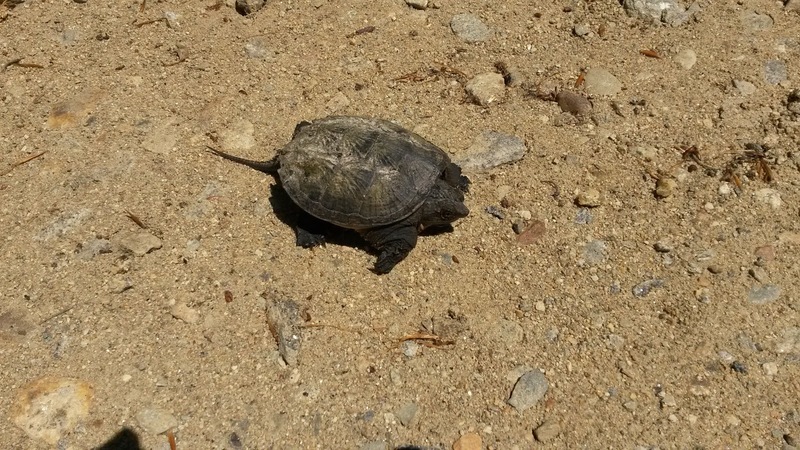 It's the time of year for turtle nesting around the lakes in New Hampshire, and it seems to be a good year based on the many reports from around the state of turtles seen on roadsides and in nesting locations. 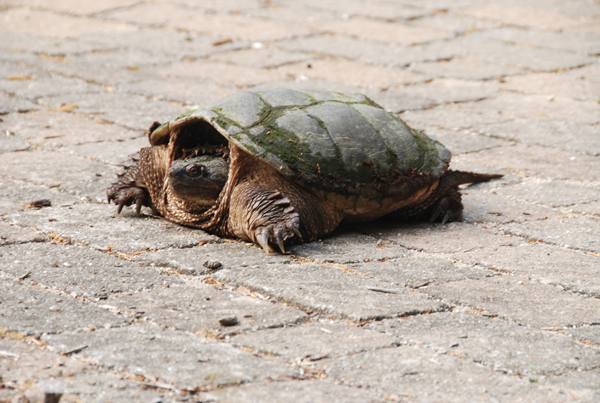 Turtles lay their eggs in sandy or gravelly soil within a few hundred feet of water, often along road sides where a soft shoulder makes for good nesting conditions; that's why they are often observed on roads, and also why cars are the largest threat to adult turtles. Around Lake Wicwas I've seen several mothers laying her eggs, and quite a few more nesting sites, identified by 4 to 6 inch round, shallow holes in the ground. Although they are laying their eggs now, they may have mated several weeks ago, storing sperm until it's needed, sometimes for multiple years. And like the largemouth bass seen last week, they might have mated with multiple males so a single clutch of eggs (which averages four or five in New Hampshire) may have several fathers. When the eggs hatch two or three months from now the young turtles may proceed to the lake, or they may overwinter in the nest and make the trip in the spring. This I just learned after seeing a very young turtle in the water two weeks ago. The pictures above were of small turtles, only 6 to 8 inches long (shell length), but yes, we do have much larger turtles as well. I saw one when I was kayaking last week, and the size of it, just a few inches under my boat was unsettling. Some fellow lake watchers had a great example of a large female walking right across their patio in search of a nesting site. Keep away from these gals! (And ones this big are all moms.) They can be very aggressive and they have extremely powerful jaws that can do real damage to a hand, a foot, even an arm! I was doing some work on an LRCT conservation property in Gilford this week (in Smart Woods, an interesting parcel with a nice hiking trail) and saw my first ever Fisher Kit - maybe only a couple of weeks old. It was on the forest floor but when it heard me it climbed up a tree, and it was definitely not comfortable climbing yet. It was quite reluctant and nervous, not like an adult that would have scooted high up in an instant! How high do I have to go? I didn't see mother fisher, but I'll bet she was watching! I took an early morning Lake Host shift doing boat inspections at the Wicwas boat ramp this weekend; I almost always see something interesting while I'm on duty, being situated right between the lake and the large wetlands in the Chemung State Forest. This time I heard the loud drumming of a pileated woodpecker and it took no time at all to locate it at the top of large pine. It probably wasn't looking for food in that dead, hard, resonant tree, but was just letting everyone know it was there and this is its swamp. After a few sessions of asserting its territory I watched it fly off, displaying its gorgeous white wings. Just the previous day we had seen a pileated - perhaps the same bird being within a mile radius - that was finding some food. Linda heard the slow thunk, thunk of its large beak working on a dead tree stump. He (the red mustache and fully-red crown including the forehead indicate it's a male) would tear out a few large chunks of the soft wood, then reach in to collect its bounty. Then he would stop to listen for more prey to direct his next attack. His strong claws were secured in crevasses in the bark to support his vigorous attack. With the regrowth of New Hampshire's forests, pileateds seem to be growing in population, but it's still important to leave dead trees since they are their primary source of food. What a cool bird, these, the largest of our woodpeckers. Especially live the pics and description of the pileated woodpeckers. Great job! Thank you so much for sharing these. Great photos, especially enjoyed the fisher and the pileated!